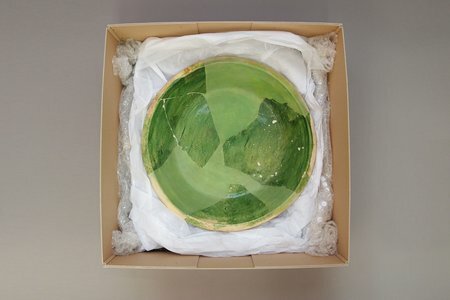 I have been working on this donated Italian Maiolica object since almost the beginning of the academic year; it is a beautiful tin-glazed earthenware dish. My first step was to research the object using the library, internet and books from the workshop. Not having previously researched ceramics in this way I was both excited and anxious to find out as much as I could. 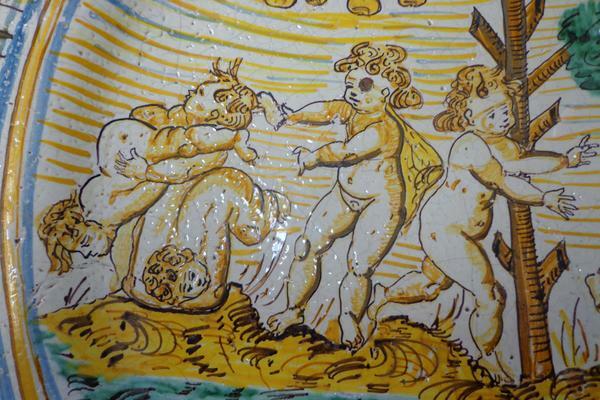 The figures on the front showed a number of children playing and I discovered a very similar scene in a book that shows a number of pieces of Maiolica from the Victoria and Albert Museum collection of the time. I could feel the excitement gathering as the search narrowed; the picture showed a wine cooler by the renowned maker Bartolomeo Terchi from Italy around 1730. Could this be a previously undiscovered piece by the man himself? The initial excitement over, I began to ponder, which is a useful skill in conservation: no rushing into things, mistakes can be made. The object on my desk did not have the finesse or quality of painting evident on the Terchi examples. After further research I was fortunate enough to have a conversation with both Reino Liefkes, Curator of Ceramics at the Victoria and Albert Museum, and Errol Manners, a B.A.D.A antiques dealer, who both agreed with me that "my" dish was not of Terchi's quality but they were of the opinion that it was from Deruta in Italy and approximately 1660 in date. This was a lesson learned not to jump to conclusions no matter how exciting. 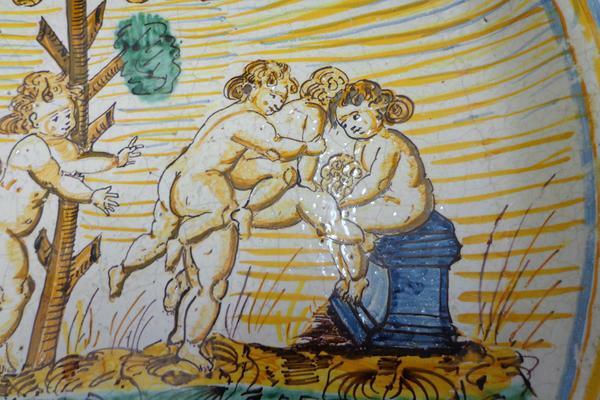 Ongoing research uncovered the origins of the picture on the dish. This, I discovered, was a depiction of children playing two separate games from original engravings by French artist Claudine Bousonnet-Stella (1636-1697) who studied engraving under her uncle Jaques Stella. She produced a series of engravings in the 1650s known as Les jeux et plaisirs de l'enfence. ("The games and pleasures of childhood.") 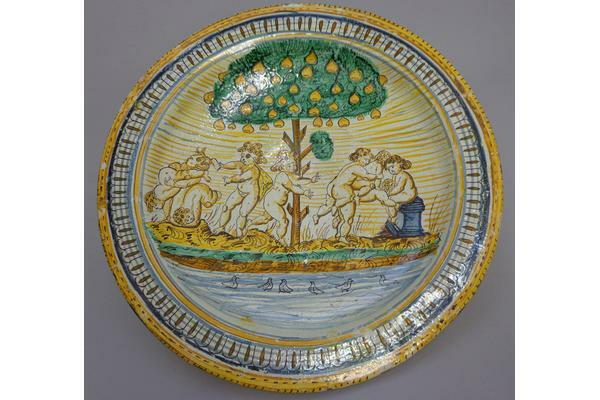 One of the two games depicted here is known as "Le cheval fondu", pictured on the right of the dish. A direct translation is something like "the lowered horse" but essentially the term refers to a very old French game similar to leapfrog, where the children line up to form the back of the horse and others act as the riders. Apart from the image in Bousonnet-Stella's engraving the same game can be seen in a painting about a hundred years earlier by Pieter Brueghel The Elder. The one on the left is "Le jeu de pet en gueule" which embarrassingly can be translated as the "fart in the face game" and is perhaps best left there! Detail of fart in the face game. The dish was certainly developing some character and brought a smile to all our faces. 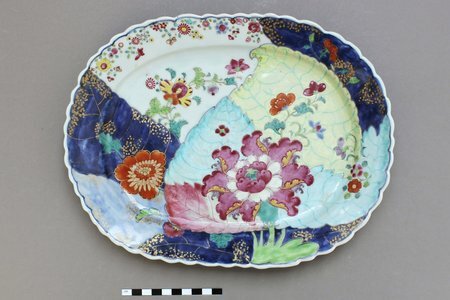 The dish is of a pinkish-coloured earthenware body with the design painted in underglaze, with a clear glaze over the top. 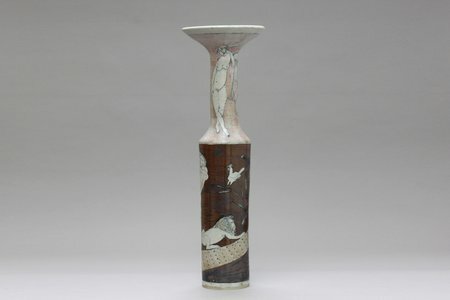 The reverse is undecorated and of a pinkish grey-coloured glaze which had pitted and crawled over most of the surface when it was initially fired. There was also a large amount of ingrained dirt on the surface which presented me with a dilemma: how clean is clean? 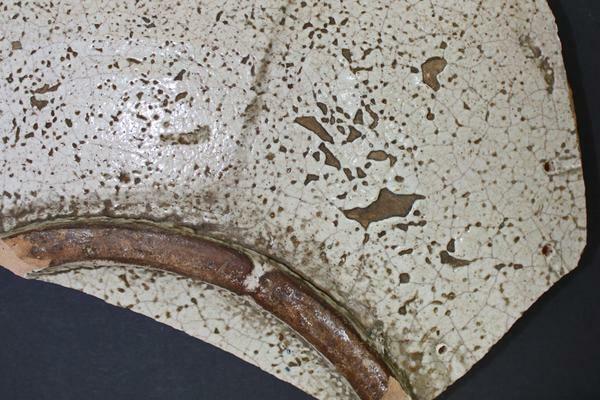 It could be possible to surface clean the dish, particularly the foot rim and old areas of loss, close to the original surface colour and texture. However this would not be in keeping with the considerable age of the dish. I would need to find a more sympathetic approach to the cleaning. 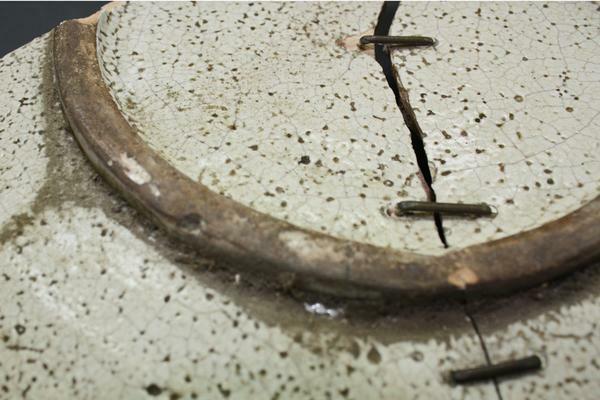 There were also a number of old brass rivets, some of which had become detached, and others were loose. There were eleven main sections and a large number of small fragments in a small plastic box. 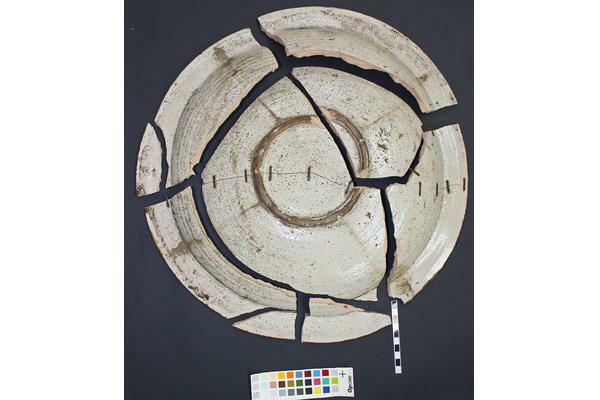 I also noted that there was a long firing crack along the reverse that had occurred when the dish was fired; the glaze had run over the edge of this. Would this cause me problems when reassembling, as it may have created a misalignment? I would need to form a treatment plan that accommodates all of these concerns. More on that in a post to follow, stay tuned!